FINRA has been actively monitoring financial technology-related (FinTech) developments in the securities industry. A growing number of FinTech firms have been embracing new technologies, pioneering innovative products and developing client-oriented financial services business models. Many traditional financial service providers are also rethinking their business models, incorporating these technologies and services. As a result of these initiatives, FinTech is transforming various broker-dealer business lines including investment banking, wealth management, trading and research. Broker-dealers are also exploring and leveraging new technologies such as cloud storage, machine learning, and blockchain to enhance their overall operational infrastructure and compliance functions. All of these FinTech-related changes are contributing to an evolving landscape for broker-dealers’ operations. Over the past few years, FINRA has engaged in an active dialogue with the industry, to assess the impact of various emerging FinTech-related business models and tools on broker-dealer operations as well as on investors. Based on its findings, FINRA develops appropriate responses, including publishing public reports and Investor Alerts. View highlights from recent FINRA-sponsored FinTech events with industry members and other stakeholders. 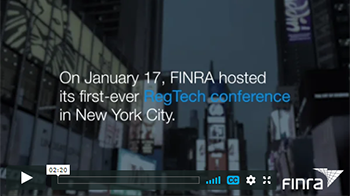 On January 16, FINRA convened its first ever RegTech Conference in New York City. Regulators, academics and innovators came together to discuss how technology is creating a new landscape for compliance efforts in financial services. New opportunities are quickly becoming available for industry participants and new challenges are arising for regulators. Issues like machine learning, artificial intelligence and anti-money laundering all played key roles in discussion throughout the day. 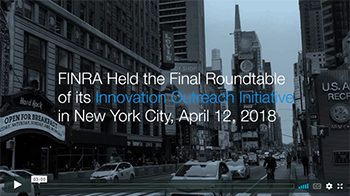 On April 12, 2018, FINRA hosted a FinTech roundtable in New York focused on RegTech, Personal Financial Management and Data Aggregation. On November 30, 2017, FINRA hosted a roundtable in Dallas on Big Data Analytics, RegTech, and Initial Coin Offerings (ICOs). FINRA’s Office of Emerging Regulatory Issues (ERI) is led by Haimera Workie, Senior Director, and is charged with analyzing new and emerging areas and trends in the securities industry. As part of this role, the office helps to coordinate FINRA’s FinTech-related efforts, including identifying new and evolving FinTech business models, and assessing their implications. To further guide this work, FINRA’s internal FinTech Advisory Committee serves as a forum to proactively identify and prioritize FinTech topics that impact the securities industry and to coordinate appropriate regulatory approaches with key stakeholders, including other regulators. This webpage is for informational purposes only. It is not intended to express any legal position, and does not create any new legal requirements or suggest any change in any existing regulatory obligations, nor does it provide relief from any regulatory obligations. FINRA encourages firms to conduct a comprehensive review of all applicable securities laws, rules, and regulations, as necessary, when considering adoption of new technologies. FINRA has issued reports in two areas of FinTech: Distributed Ledger Technology and Digital Investment Advice. FINRA is also exploring other emerging areas in FinTech that are having a growing impact on the securities industry, including RegTech, artificial intelligence and social media sentiment investing. Each of the these FinTech areas are briefly discussed below. View FINRA's recently published report outlining these issues. Artificial Intelligence (AI) generally refers to the “intelligence of machines” – i.e., science of computers performing tasks that are traditionally conducted by humans based on human intelligence. AI is rapidly being incorporated into various aspects of the financial services industry, ranging from personalized automated advice and chatbot customer service, to trading based on social media sentiment, to highly sophisticated fraud surveillance. Social media data analytics companies: These companies generally use natural language processing technology to aggregate and analyze social media across various channels and identify early signals of market sentiment. Some broker-dealers are setting up strategic partnerships with such companies and providing access to their brokerage platform to allow individuals to trade based on the forecasted trends. Social media sentiment based product issuers: Some data analytics companies have developed indices to track social media sentiment, and a couple of issuers recently launched ETFs referencing such indices. Crowdsourced research networks: These companies operate websites that seek to crowdsource ideas either from the retail public at large or from the buy-side community. Some proprietary traders and hedge funds purchase such analysis to inform their trading strategies. Social networking platforms: Certain online brokerage websites offer social networking platforms for users to share and discuss trade ideas amongst themselves. The term “digital asset” generally refers to cryptocurrencies and other virtual coins and tokens (including virtual coins and tokens offered in an initial coin offering (ICO) or pre-ICO), and any other asset that consists of, or is represented by, records in a blockchain or distributed ledger (including securities and non-security products). The market for digital assets has grown significantly and has increasingly been of interest to retail investors. At the same time, investor protection concerns exist, including incidences of fraud and other securities law violations involving digital assets and the platforms on which they trade. As such, FINRA has a keen interest in remaining abreast of issues in this area as this new market presents unique challenges and considerations for broker-dealers, regulators and investors. This new market presents unique challenges and considerations for broker-dealers, regulators and investors. FINRA is committed to providing guidance to the industry through various methods such as the report on Distributed Ledger Technology, Blockchain Symposium and Regulatory Notice 18-20. In addition, we Keep investors informed on the topic with resources and facts. 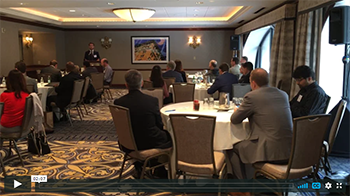 The purpose of the roundtable was to facilitate a dialogue with industry members and other stakeholders that will help FINRA better understand FinTech innovations and their impact on the industry. During the roundtable, there were participant-led discussions focused on 1) artificial intelligence and its impact on financial services; 2) the impact of FinTech on the securities industry; and 3) regulatory technology (RegTech). FINRA’s Blockchain Symposium was designed to bring together regulators and industry leaders to discuss the use of blockchain and related opportunities and challenges. The half-day symposium looked at the changes that are occurring or may occur in the future as a result of the implementation of DLT applications in the financial industry. It also featured discussions of the potential market and regulatory implications of these changes. View the Blockchain Symposium Brochure.